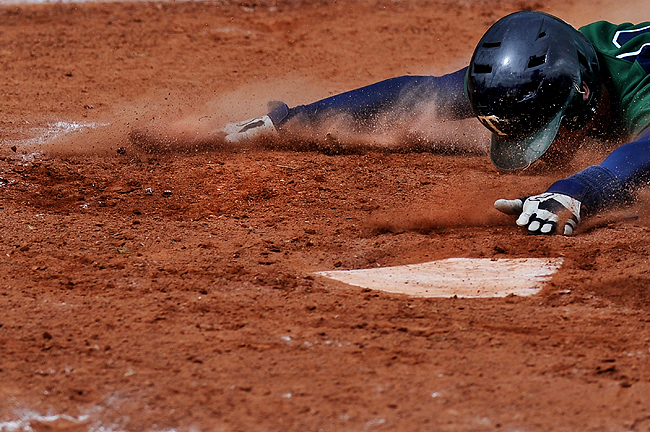 "Timpanogos' Ryan Hamilton (9) slides face first into home and the dirt in the third-inning against Bountiful during the class 4A baseball first-round playoffs at Timpanogos High School, Tuesday, May 11, 2010. Despite Hamilton being called out on the play, Timpanogos won, 10-1." I am really finding it hard to talk about all these baseball photos I've been making of late. To this date I've never shot so many consecutive baseball games. In addition, I've never made this many baseball photos I've liked either. Maybe I am growing to appreciate the game and finding ways to make it fun rather than mundane. The other day I climbed a fence to get on top of the visiting team's dugout. I am finding that getting to an elevated position helps shooting the game and helps eliminate the gaudy advertisements that litter the outfield walls. I am also shooting very, very tight. In most cases I am using work's Canon 1D Mark II N with a 1.4x and a 400mm. However, in this instance I was using a Nikon D3 with a 300mm because of my distance to home plate from the dugout. Way more sports to come. Its been that kind of month. But I'll break it up with my recent Monday Close Up story.